In this situation, you're playing in a single deck game and are dealt a ten and a five for a two-card total of 15. The dealer shows a nine as his upcard. This is going to be a tough hand for you. The question is, should you take a hit and risk a chance of busting out, or should you stand and hope the dealer busts out? To be real honest (and we always are) you have got to hit this hand. But make no mistake; in the general scheme of things, you're not likely to be a winner here. You're going to lose at least 70% of the time no matter what you do. 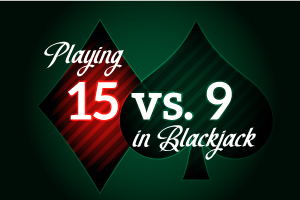 The 15 is undoubtedly one of the worst hands a player can get, and in the vast majority of situations there's very little you can do about it. You'll bust on one hit with 26 of the 49 hands left in our theoretical deck. So we just need to make the move that will help us make the best of it. In this case, taking a hit to the hand is proper. You'll only lose 70% of the hands. Conversely, if you decide to stand, you're going to lose the hand 77 out of 100 times. So while you're a loser, you'll make yourself LESS of a loser. You're going to find that these kinds of "defensive" plays are necessary in blackjack, where the odds are often substantially against you. If there's any small consolation, it's that you won't get this bad a hand all the time.